If you don’t care about big time pro sports, you’d better skip this entry. Me, one of the passions of my life is baseball. And, coming from the north side of Chicago, my favorite team is the Cubs. The team that defines losing. That hasn’t been in a World Series since Gen. Douglas MacArthur was the military provost of Japan. That hasn’t won a World Series since Butch Cassidy and the Sundance Kid were still on the lam in Bolivia. 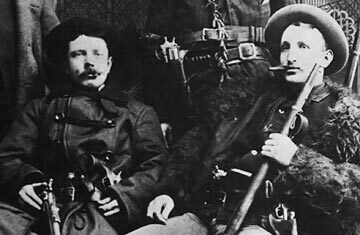 Butch & Sundance: Did They Know The Cubs Had Won The World Series? The Cubs have broken my heart more than all the women I’ve ever been in love with put together. The team has kicked me in the gut in the years 1969, 1971, 1973, 1977, 1984, 2003, 2004, and 2008. Yep. Each of those years, they teased me, drew me in, caused me to dream and hope, seduced me into thinking that maybe, just maybe, this was the year they’d finally reward me for my saintly, super-human loyalty. But each of those years — improbably, bafflingly, weirdly — they found startling ways to lose. And I’m not even mentioning all the times they lost when they were supposed to lose. 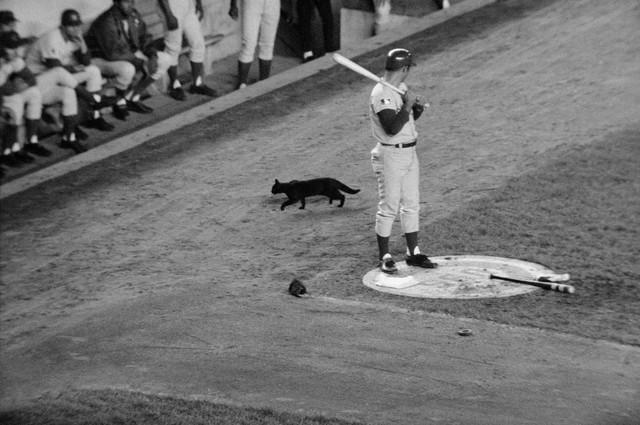 Rooting for the Cubs is like…, um…, it’s like…, uh…, well, it’s like nothing else on Earth. For chrissakes it’s just a baseball team. Still, I fret and hope and wring my hands over them as if their purpose in this crazy, mixed-up world is to create world peace or at the very least find a cure for cancer. It’s inane; I admit it. Anyway, the definitive Chicago Cub, one Kerry Lee Wood of Irving, Texas, perhaps the most celebrated pitcher ever to emerge from high school, retired yesterday afternoon. He knew in advance he was going to do it. He knew he was finished. He knew he couldn’t get batters out anymore on a consistent basis. And he knew, more than anything, that his body couldn’t take the stress and strain of throwing a baseball faster than a Porsche speeding down the Tri-State Tollway. Friday afternoon, Wood was put into the game to face one batter, a powerful lummox named Dayan Viciedo of the cross-town White Sox, in the eighth inning of a tight game. Viciedo is capable of launching a pitched baseball into orbit around the globe. He’s also likely to screw himself into the ground swinging and missing. The White Sox were threatening with a runner on base. A long one off the bat of Viciedo could have put the game out of reach. Kerry Wood threw three pitches to the young Cuban. Viciedo struck out. That was that. The end. Wood left the game. 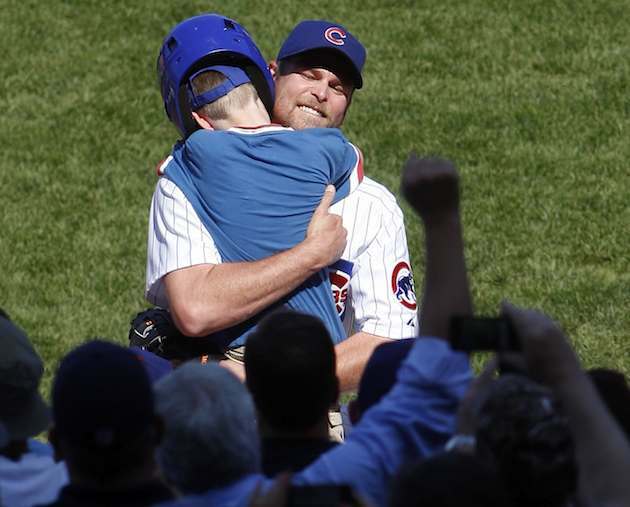 His son, the Cubs batboy yesterday, leaped into his arms. Wrigley Field fans stood and applauded him for long, long minutes. “Mentally and physically, we get to this point,” Wood said after the game. He will no longer be “Kid K.” Now, he’ll be living out the rest of his days. He’s a greybeard in the closed world of sports. Of course, he’s really young in the real world. He turns 35 in less than a month. And he’s made a pile of dough in the game — a tad better than $70M over his 14-year major league career. His leaving is no tragedy. I may be a baseball fan but I have a semblance of human perspective. 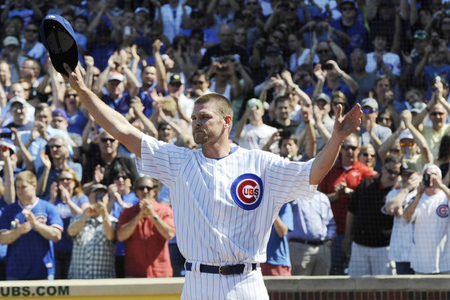 The end of Kerry Wood’s career as a baseball player serves only to remind me how fast time passes. Let’s go back to the rainy, chilly afternoon of May 6th, 1998. Just a little more than 14 years ago. I’d been writing at my coffeehouse/back office du jour, Bic’s Hardware Cafe on Halsted Street in the East Pilsen neighborhood. The rain let up a bit at around 4:30pm. I figured it was a good time for me to jump on my bicycle and pedal home, some three miles north. Passing through a viaduct under the railroad tracks at 16th Street, I rode over some broken glass and got a flat. I checked my tire repair kit in my backpack and found I’d run out of patches. 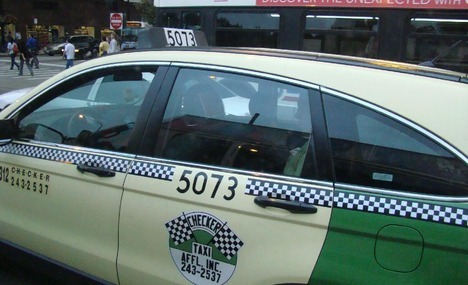 So I flagged down a taxi. I convinced the driver to let me stash my bike in his trunk (fortunately he was driving one of those enormous Ford Crown Vics). I plopped into the seat and we sped off north. I literally recoiled. “Uh, sure,” I said, after a sufficient puzzled pause. “I dunno. What happened?” I said. He became excited. I think he bounced in his seat. He stared at me in the rearview mirror as we barreled north on Morgan Street. “They set the record!” he gushed. Now, just try to imagine an Arab cabdriver with a thick accent gushing about this kind of baseball arcana. I figured it was the Cubs batters who’d set a strikeout record. Maybe they’d struck out 22 or 23 times. Hell, it’s the Cubs, I mused, they might have struck out 27 times. A baseball team makes 27 outs in a nine-inning game. Knowing the Cubs as intimately as I do and did, it would have been perfectly logical for me to suppose they’d whiffed every time they came to bat that day. “So how many strikeouts did they get?” I asked. Again, the thick accent. “Twenty!” he said. Now I was truly stunned into silence. And for the rest of the ride, we talked baseball. A true American story, no? That game against the big-hitting Houston Astros is arguably the greatest single pitching performance in the history of baseball. Wood gave up one squibbly little hit, a grounder that the third baseman almost snagged. He walked no one. The mighty Astros were helpless against his offerings. His fastball was in the high 90s. His slider fell off the table. His curveball bent like a boomerang. The Astros looked like little kids flailing against a grown man. Years later, after You Tube came online, I watched the video of Wood toying with the Houston batters. His pitches moved that day in a way I’ve never seen before. By the time he got to the fourth inning, I thought, Man, this is inhuman. It was not humanly possible for Wood or anyone else to put enough spin on a ball he was flinging with all his might to make it dance so much. He did it for one game. The structure of the human shoulder and elbow would not allow him to do it again. Not that he didn’t try. A very few major league pitchers can make the ball seemingly appear and disappear on the way to the plate as if by magic. They may try to throw one or two such pitches, just to show off. But guys who make their living hurling baseballs have learned long before reaching the big leagues that they cannot expect their arms to suffer the loads and stresses, the contortions, the abuse that truly unhittable pitches demand. Successful pitchers learn to take care of their arms. Human beings can do a lot of amazing things. They can climb Mt. Everest or march across Antarctica. But they may suffer the bends or lose a finger or toe or two to frostbite. So they learn they can’t do amazing things all the time. Nobody has that many fingers or toes. 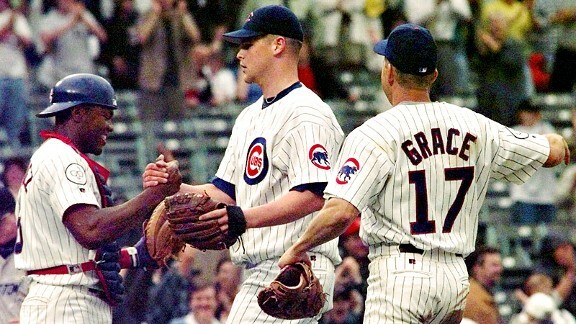 Kerry Wood only had one right arm. He was successful for a day. By the end of the 1998 season, Kerry Wood’s arm was torn to shreds. He underwent reconstructive elbow surgery that off-season. He never was the same again. It was the equivalent of an Olympic pole vaulter soaring 40 feet in the air, setting a record and stunning the world, but crashing down to the ground with enough force to break his spine. He did it but he would never do it again. And Kerry Wood did stun the world that day, at least a corner of the world that contained a native Chicago writer and an excited Arab cabdriver. Of all the Loveable Losers stupidstitions, abusing pitchers is by far the least admirable.